As I write this I'm waiting on my second batch of crumpets to rise. That's how much I enjoyed making and eating the first batch. There's something really more-ish about crumpets and I think it's related to the comfort food factor. I associate them with cold evenings and a mug of hot soup, butter dripping through a couple of toasty crumpets. They're also something I ate mainly in childhood so they have that veil of nostalgia. I've never made them before although I remember my mother making them. Mum liked to try out English baking recipes which I guess came from the fact that she spent the first eleven years of her life in the UK. One of her favourites was Elizabeth David's English Bread and Yeast Cookery (or was it Jane Grigson's English Food?). I particularly remember sampling crumpets, muffins and also Lardy Cake (the name doesn't lie and it was too lardy for my taste at the time). Anyway crumpets are much easier to make than I thought (which is dangerous). Fortunately for waistlines across the world there's two hours of rising time to factor in which could put off those late night impulses to get out the standmixer. There's no such restricting factor with my favourites, scones, which is very dangerous indeed, in a waistline expanding sense. Of course, it wasn't a completely mistake-free performance. I was working through the list of ingredients and blithely threw in the baking soda with the flour mixture instead of the cream of tartar. I wasn't sure what effect that would have on the crumpets but I knew I definitely wasn't going to start again. The dough certainly looked ultra bubbly after the first rise but when it came to cook them after the second shorter rise they seemed to be fine. 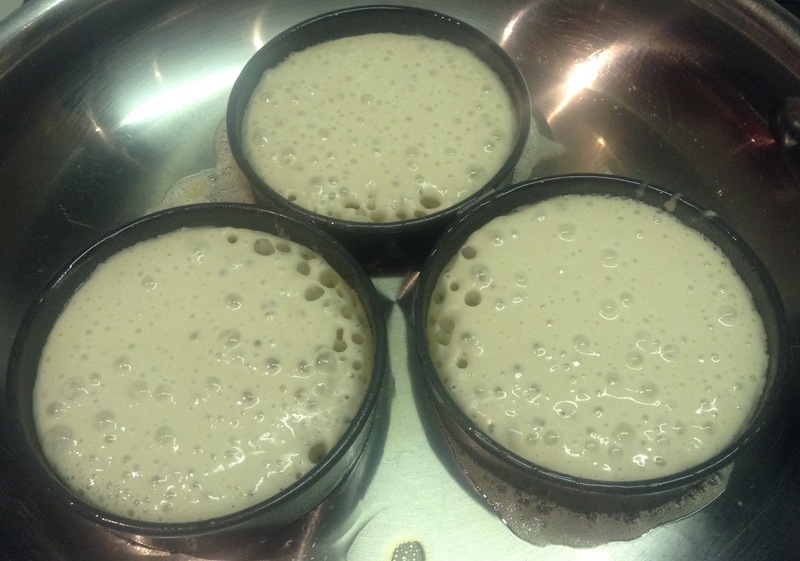 You can see the progress from bubbly liquid to holey crumpet in these photos. It was pretty exciting to see the first signs of a crumpet-like form emerging from the batter. 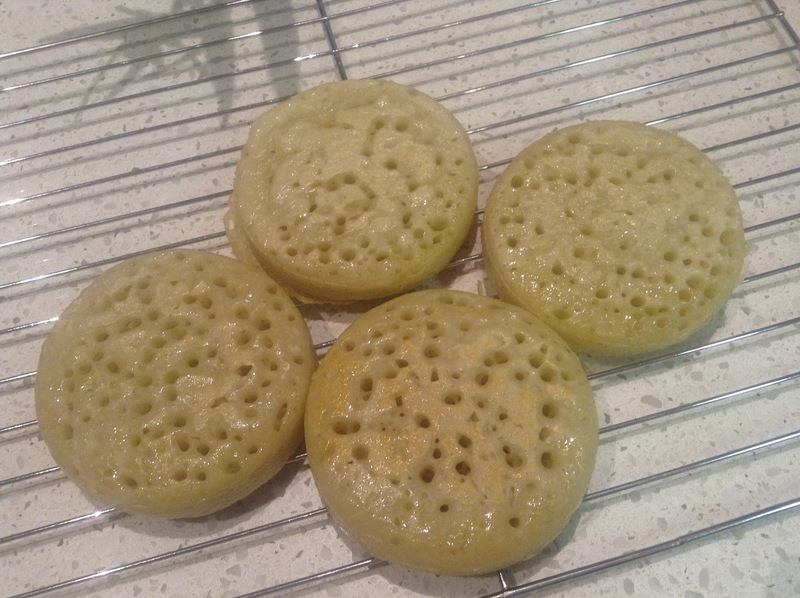 I really wanted them to look like the shop-bought crumpets with a pale, holey, uncooked-looking top. In the end I had to flip them over to fry the top briefly because there was always a little bit that hadn't firmed up. 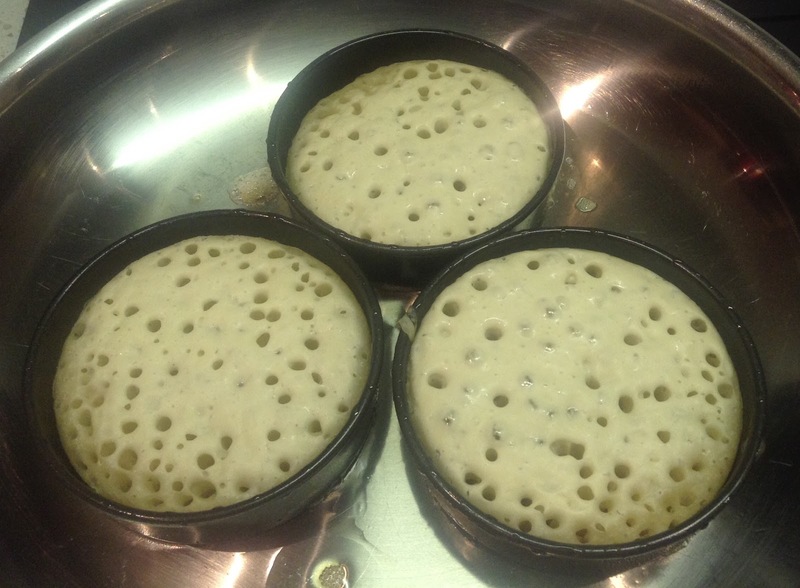 It took a bit of fiddling to get the right level of heat to set the bubbles in the crumpets without burning the bottoms. I think I made mine a bit too thick. They were very tasty but they were also a little bit stodgy. In about 10 minutes time I'm going to try making the next batch a bit thinner. The first batch were still blissful toasted with butter and honey. Next week the Alpha Bakers are baking Blueberry Buckle, although mine might be raspberry buckle (even though it doesn't have the same awesome alliteration). 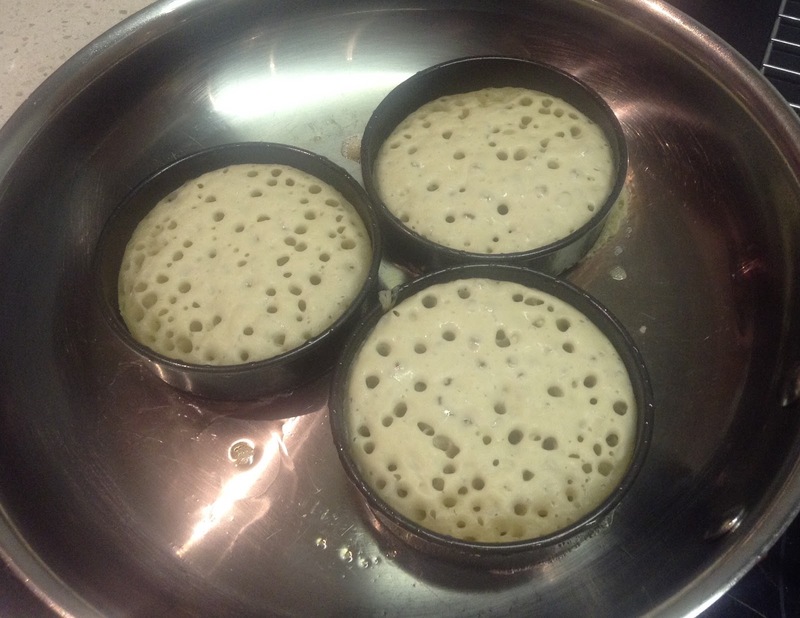 Ahhh ha they look like… well "crumpets" and the baking soda has given you plenty of holes :) Something from my childhood too, so I'm with you with the veil of nostalgia. Butter and honey … yum!!! quel crumpets! makes me want to make them again too! Look at all those holes! They look like the ones in packages here. How lucky you were to have them in your childhood. 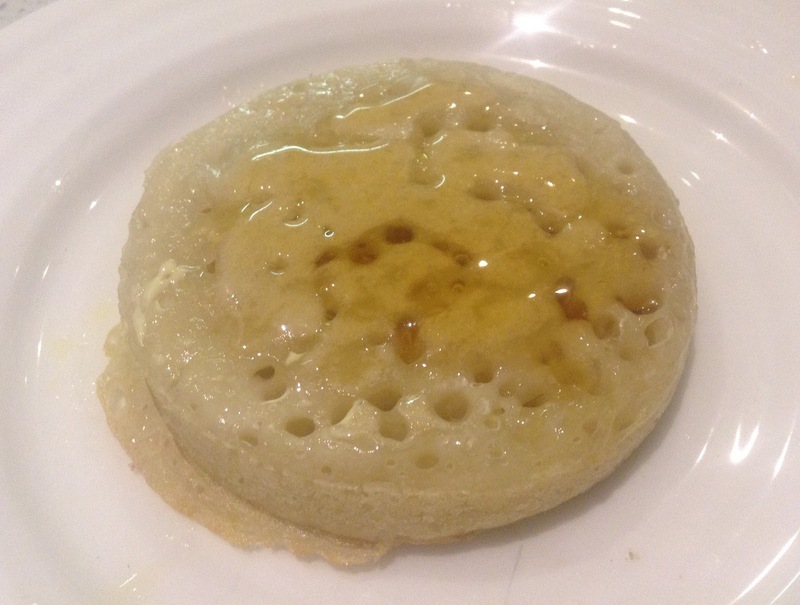 I was well into adulthood before I ever saw my first crumpet. They turned out perfectly. These looks wonderful! So holey!! !